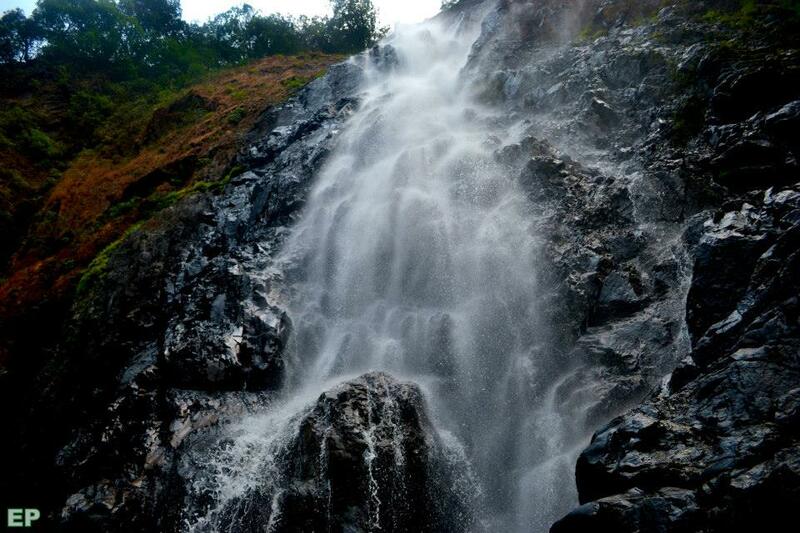 Below I am describing about one more beauty in Sharavati - The Dabbe falls. Things Must Have while trekking Dabbe : Good pair of trekking shoes, Rope, Water bottles and a guide. fixed my next trek to organize, and one more thing which attracted about Sharavati was The Water. The most Pleasant, Cool, purest form of water I have ever experienced, so things got fixed in my mind about my next adventure-to Trek Dabbe followed by Water Activities next day :-D.
As Now I knew the local People somewhat well, I started checking about the possibilities of the two day Activity in Sharavati; after thinking alot zeroed on Dabbe Trek for 1 day, Camping in the island, followed by water activities like Swimming, Kayaking Canoeing on the next day. we were 19 in group, journey started around 10:00pm from majestic on a friday night. I never knew playing antakshari was so much fun; so few people turned the whole scene around, and made us to laugh like hell. We reached around 6:45AM at Kargal on sat Morning, had some tea and waited for a local guy to Show us the base camp. We finally reached the base camp, this time it was different. There was a Temple inside the forest, everyone started to fresh themselves up and me along with few bunch started exploring the surroundings. There we found a Water Stream, good view of a stream with cool morning essence, there waited our Morning breakfast, Idli, Wada & Sambar followed by Tea-Hmmm Yummy. We left to the trek Starting Point in our Bus which was 20 KM Away and there we go some wildlife, we saw 6-7 Cheetal Group Passing our way, and few had a change to Sight the Rearly Found Macaque-The Lion tailed Monkey. We reached the Trek Starting point @ 10:30AM, we started to Trek to Dabbe-with our Backpacks along with 3 Guides who even carried groceries for our afternoon lunch on their heads. We never felt we are trekking in summer because the trail was mostly Covered with Dense Forest, walking through several Streams, remember we all are very much unknown to each other, it was totally a strange group united for this memorable adventure. We started knowing each other and found that we are alike when it comes to adventure, now was the challenge, we came across a steep which was 45% all over for a KM. We are set aback that we need to really follow this trial, as someone rightly said – the difficult way always leads to heaven. It’s of course said by me, there was a couple who aged above 50, I couldn't really believe they actually trekked it. Awesome energy shown by them, you have to be very careful as this terrain has lots of rock which are not strongly grounded and if we step on them the person on the incline next to you will get badly hurt. We stepped on several rocks but luckily no one got hurt, and after descending to a ample amount of distance, we were shocked to see the trail got more worse as some 20 Mts we need to Descend by holding rope. But believe me what an adventure experience that was, than we saw the Beauty making sounds, and mesmerized to see a Fall falling from a height of 150-200 Mts in the peak summer we were actually witnessing the Waterfall which had Ample amount of water to pleasure our Eyes. Everyone wanted to get down in Water after this difficult Trail, so no one wasted time to make their sweat worth. We all had great time in the purest form of water, singing, shouting, cheerful moments for all of us. We spent around 2Hours in water and it was 2:30PM, we started ascending back-guessing how difficult it would be to climb on the same terrain, but it was not so much difficult. The food was all prepared and we wasted no time to grab that delicious food. It was Rice with Drumstick sambhar with pickle and papad. We took some rest and then started our 4KM trek back to the bus. We boarded and started to Travel towards the island where we need to Camp that night, reached one of the tribal house where we had the best Kashaya (kannada word – a herbal hot drink) and followed by Mirchi Bajji. Mouth watering those were; it was already dark and we need to cross the river in that pitch dark evening. The island-HALKE was located far around 1KM from the mainland, we took a coracle and reached the island by around 8:00PM, wow what a lifetime experience, being in water when its dark, and riding a coracle....it was a pitch dark island where we can see only the campfires, no other forms of lights ever existed, we all rejoiced the amount of adventure we had on day 1, followed by some great mature talks about our passions by Chitra (Remember the old Couple). We had several debates, cool breeze as we were very much nearer to the water, few people slept as they were too tired, than the food was all on the way. Everyone woke up to see what’s on the platter, hmmmm all eyes were wide open smelling that delicious food in the jungle. It was Bisibelebath, Curd rice, Chappati with Cabbage Curry and Sweet (paisa-made up of rice). We all had tummy full dinner and then everyone headed towards the tents where our nature sleep was planned. Everyone slept but me along with 3 friends went near to the river and started exchanging our experiences as you know these day are just for once and they will never come back so we thought of skipping our sleep for few hours although we had worst sleep on the other day. We traveled cool wind, the sight of a moon, and pitch black island with everyone slept, made the night more calm and clean. After spending few hours we slept in our respective tents as well. The sun arises next morning, we woke up by 6:30AM, coming out of our respective tents, we felt so lovely feeling the chilled air, with Sun just showing his effects, a beautiful Sunrise on the island was treat to watch. Although maximum people were still in tents napping, myself along with few friends went to explore the island forest, walking inside the forest on the Halke island felt so good due to the cool Breeze, it was no natural, no human traces at all, we took a two KM walk and returned back feeling nature. We freshened up ourselves, backpacked things, our breakfast was ready - it was Ragi and Rice Dosa with yummy tasting Sambar & Chatni. We finished our breakfast, now time to take a dive in the river we were appreciating all night and day. Initially non-swimmers very bit scared, but with the life jackets on, everyone was pretty confident that they would never sink. However, the trainer instructed few precautions and they we all were into the cool, pure water, ahhh it felt so good, but actually we had to swim all over a KM to reach the mainland. Believe me, we never got exhausted swimming so long. We climbed the dry trees in the middle of river and took dives, words fall short to express such feelings, amazing it was. After 4 hours we reached the mainland swimming all the way, but no one was ready to leave water even after so many hours. Then we took our respective kayaks and Coracles and started our rides, wonderful is what I can say. After these fun-filled water activities, we were damn hungry, and by 2:00PM our lunch was ready, again a great lunch which included, pulao, curd rice, papad & pickle. We relaxed for about 1 hour and started walking back to the tribal house where we have parked our vehicle. We reached and tea was waiting for us and finally we departed to Bangalore. Being in Sharavati again was amazing and unforgettable lifetime experience for me. Group : Somnath, Chitra, Sanjay, Nidhi, Rishav, shravan, Ritesh, Sunny, Sukumar, Burhan, Yunis, Bhajish, Pratik, Ankul, Soumil Roy, Karan, Rajesh, +2. Awaking an Adventurer in you"Tranquil Voyagers(TQV)..... Simple theme. Powered by Blogger.